I needed a project to do while spending time at my parent's house. 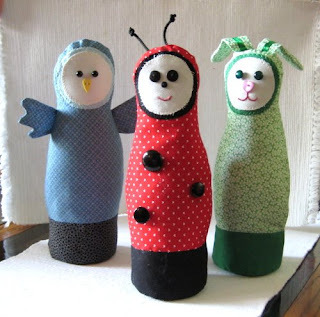 I have so many fabric remnants and odd buttons that I thought of making bowling pins for my girls. I brought with me the easy pattern I created, some notions for antennas, eyes, and noses and sewed like the wind! I used navy beans for the base and stuffed the critters with recycled pillow stuffing and fleece. 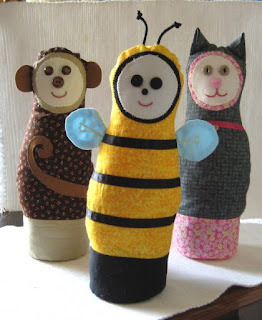 I made a bumble bee, ladybug, monkey, cat, bird and a bunny rabbit. How cute!!! Have the Peas seen them yet? I bet they are going to love them!! What is the bowling ball going to made into/out of? Can't wait to hear how they liked this!! !